In times gone by, greenkeepers like myself used lawn sand to control weeds and moss as part of our annual lawn care program. 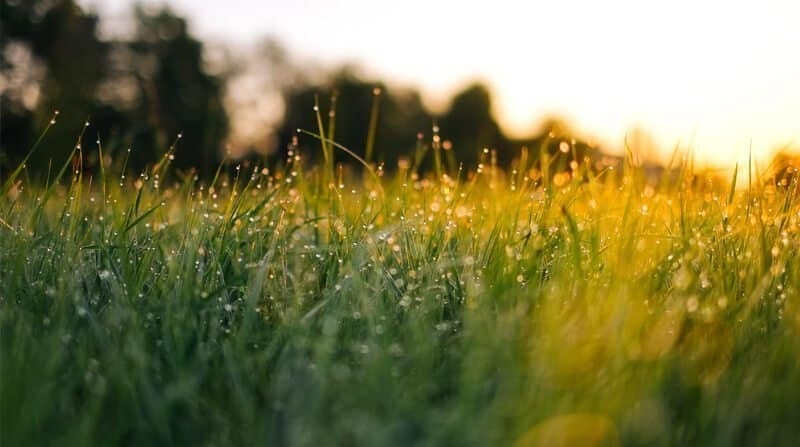 These days, with modern weed killers and moss killers designed especially for use on lawns becoming ever more popular, traditional lawn sand is considered old fashioned. So much so that some people have never even heard of it. In this article, I’ll explain what it is as well as when and how to use it. What’s the Difference Between Lawn Sand and Liquid Moss Killer? – Which Should You Use? Despite it being considered ‘old fashioned’, you can still buy lawn sand at most garden centres. It’s a product most commonly used to control moss in turf, although it can kill broadleaf weeds and gives a lawn a nice boost of green colour. It can also change the pH of your soil over time, making it more acidic which is perfect if you have finer grasses in your lawn. Also known as Ferrous Sulphate, this is the ingredient responsible for killing moss. The most common way to use Iron Sulphate to treat moss is to dissolve it in water and spray over their lawn. This ingredient contains Nitrogen and encourages strong grass growth. This is the ideal fertiliser to use in the spring when the soil is still on the cold side. Other Nitrogen fertilisers might not work until the soil has warmed up. The sand content has absolutely no benefit to your lawn. It simply helps to distribute the product easily. By its makeup, lawn sand is ‘selective’ in which plants it affects and kills. The difference in shape and structure of grass and weeds enable it to only kill broadleaf weeds and moss without affecting the grass. When applied to a lawn, it settles on moss and broadleaf weeds, scorching them and turning them black. However, because grass stands vertically, lawn sand can’t settle on it. It falls into the turf instead where it can fertilise the soil. What’s The Difference Between Lawn Sand and Regular Liquid Moss Killer? In essence, lawn sand a regular liquid moss killer are the same product. They’re both made from Iron Sulphate. The way they are mixed and applied – Lawn sand is Iron Sulphate mixed with sand for easy spreading. Liquid moss killer is Iron Sulphate is mixed with water. 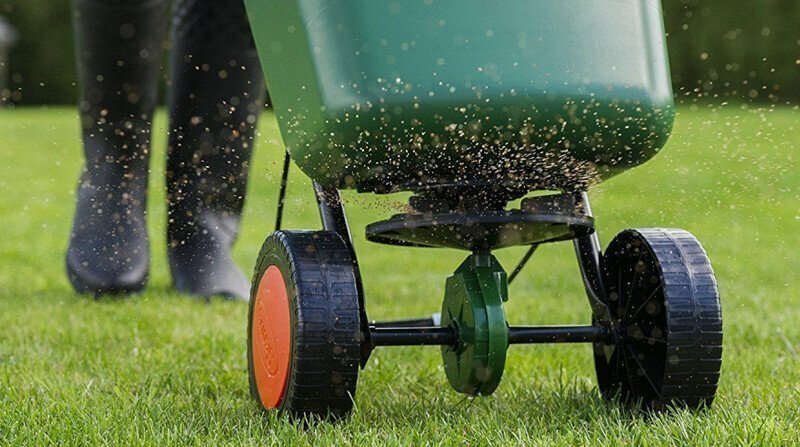 The addition of a Nitrogen based fertiliser – Lawn sand often contains Ammonium Sulphate that encourages grass growth. Liquid moss killer doesn’t. For the most part, it very much depends on personal preference. If I’m renovating a lawn I’ll use a liquid moss killer because I don’t need the Nitrogen fertiliser at the time I’m applying it. However, if a lawn has escaped the winter with very little moss, I’ll apply lawn sand instead of a liquid moss killer. This will kill the little moss that’s present and also give the grass a shot of fertiliser heading into the spring. It’s as simple as that really! When learning how to apply lawn sand, it’s important to also know when to do it to achieve the best results. The best time of year to apply it is in the spring. Generally between the end of March and the middle of April is best but this very much depends on the weather. When you see early signs of grass growth as the weather starts to warm up, that’s the best time to apply it. If necessary, you can also apply it in the summer. Don’t be tempted to apply it too early. The Ferrous Sulphate will kill the upper layers of moss but it’ll be too cold for the Ammonium Sulphate to work and fertilise the grass. 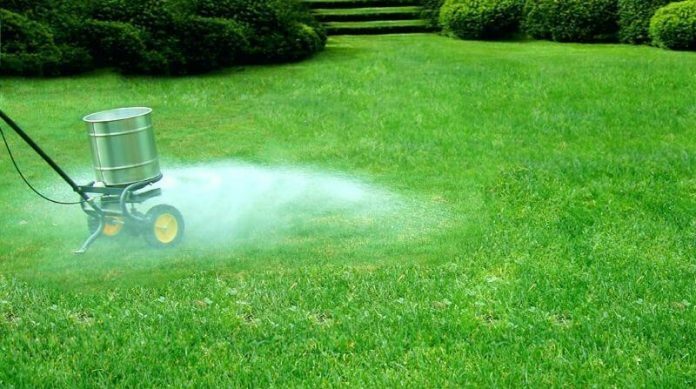 Likewise, avoid applying it in drought conditions as the Iron and Nitrogen content could scorch the grass. It’s also best to apply it in between cuts. Many suppliers recommend you don’t apply for 3 days after or before the next time you cut the grass. So it’s best to cut the grass, wait for 3 days and apply it on the 4th day and then wait at least another 3 days before mowing the lawn again. Cutting the grass before application ensures you get good contact between the moss and the moss killing ingredients. Iron Sulphate can stain pathways, drives, clothing and pretty much anything it comes into contact with. Therefore it’s really important that you apply lawn sand when conditions allow you to do it safely. This means on a dry, calm day with no wind to blow it into and over areas you don’t want it. Whichever way you spread it, make sure you stick to the application rates suggested by the manufacturer. Also, spread it as evenly as you can without crossover and without missing patches. Measure your lawn to get the square meterage. For example, my front lawn is 7m x 5m. 7×5 = 35, or 35 meters squared. Now times that by the application rate set by the manufacturer. Let’s take Westland’s Lawn Sand. They say you should apply their product at a rate of 80 grams per square meter (this number will vary from supplier to supplier). So 80 grams x 35 meters = 2,800grams. That’s how much you need. Split your lawn sand into two equal lots and work in different directions for each lot. For example, you might take the first lot and spread from north to south or from left to right, depending on how you look at your garden. Then spread the second lot in the opposite direction. So from south to north or from right to left. This will ensure more even distribution. Again, split your lawn sand into two lots. Pour the first lot into the spreader and set it so it’s halfway open instead of wide open. Then push your spreader up and down the length of your lawn, in the same way you’d mow the grass. Pour the second lot into the spreader and then go across your lawn at a 90-degree angle to your first pass. Yes, you have to cover your lawn twice but it prevents over-application and running out of lawn sand before you’ve finished. The lawn needs to be watered within 48 hours of applying lawn sand to get it to work. If the weather is on your side you can leave it up to the rain. However, if no rain is forecast you’ll need to water your lawn thoroughly. Also, keep the kids and pets off the grass until it’s been watered. For some reason, applying lawn sand is considered old practice. It’s much more common to apply Iron Sulphate in liquid form than it is to apply a dry mix. At the end of the day though, they’re essentially just two ways of doing the same job. It just comes down to personal preference. Do you still use lawn sand in your lawn care regime or are you a new age gardener that’s never heard of it? I’d love to know your thoughts and experiences so leave a comment and I’ll join in the conversation.